Go Abbe: Big brother’s visit. 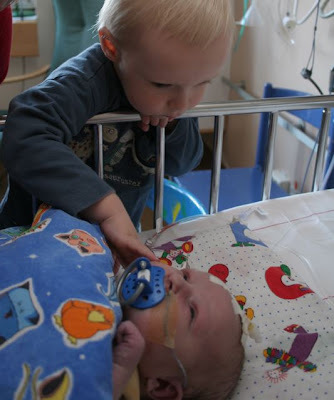 Today big brother came to visit Abbe for the first time. It was exciting. He must be wondering. Why isn’t Abbe coming home? Why has he got a tube up his nose and sticky tape on his head? Why do I have to wash my hands with the smelly stuff that makes your hands go all cold before I go to see my little brother? We’ve tried to explain things to him, as best we can, but how much of all this can he actually grasp? How much can a two-year-old possibly understand of what is going on? He’s only a baby himself.